Ever wondered what the manga-types at Japanese Publisher Entebrain would do if they got hold of ‘The Court of the Air’ and did a trad. 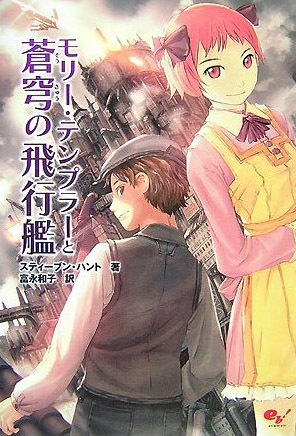 manga cover for the book? Well, wonder no more, for here it is. I’ve just ordered a copy of it from Amazon Japan and will report more fully when I get my hands on it. Not sure if it’s an illustrated work inside, or if it’s my text translated as Kanji-script, as my Japanese publisher does both illustrated and non-illustrated editions for its Western authors. what was the end result, just a translation or part illustrated? Not illustrated, alas, apart from one interior b&w piece of art, a translation into kanji script – albeit a very nice-looking one. Gutted. it would seem i got the wrong end of the stick, i thought it was a manga feature film of the court of the air. Oh well, guess i’ll coninue living in hope. You and me both, Al. I just happened to read the Court of the Air, earlier this week. I found it while looking for steampunk books. I was rather impressed by the writing style, and now that I know there are more, I plan to read them over the next 2 weeks, if I can get them all. Also, The Court of the Air done manga style would be awesome. Hi Josh – well, number six in the series is coming out in the UK late this month (From the Deep of the Dark).